‘Tis the season for travel. This summer Americans will be loading up their RVs and putting more miles on the road than ever before. If you’re thinking about purchasing a brand-new RV, then now is the time to take advantage of summer sales, discounts, and seasonal deals. If you’re wondering which RV is best for your family, then we’ve provided our picks for the top 20 RVs for 2017. 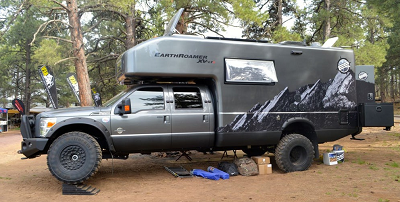 You will never find a cooler Xpedition Vehicle (XV) than the earth roamer. 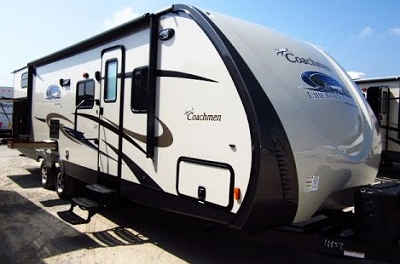 These Colorado hand-crafted all-terrain Fords are more like a luxury apartment that fits 4-5 campers and has a wide range of features including HD TVs, plush leather, and several amenities. Do you own a large pick-up? The Finch is an ideal fixture on the bed. It is perfect for smaller excursions or fishing trips with just one or two people. There are numerous that come with the Finch including a refrigerator/freezer, roof racks, battery power, and even a water purifier. Simply put, the Mehrzeller is totally rad! While its exterior shape is sure to turn heads, it’s what’s on the inside that counts. The Mehrzeller is extremely spacious and built to host several people for an outing or a sleepover. It has a cool modern design built for Millennials. 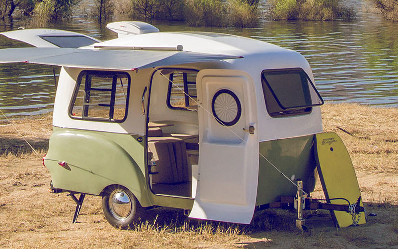 If the cricket trailer looks more like modern aircraft, it’s because it was designed by former NASA engineer, Garrett Finney. The Cricket is light enough to be pulled by SUVs or larger sedans and is more spacious than meets the eye. 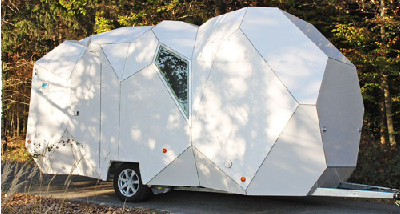 The Happier Camper is a throwback to 70’s travel trailers. It is extremely lightweight and is cram-packed with components that range from shower fittings and digital heaters to smart device docking stations, an AC unit, and even on-board solar panels. 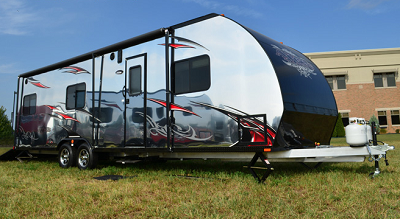 If you’re planning to haul motorcycles, ATVs, or UTVs this summer, then the Toy Hauler is your best bet. 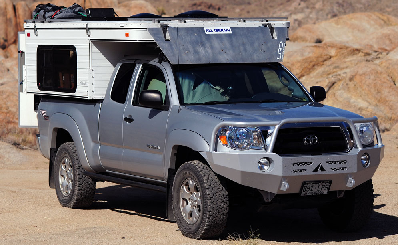 It can haul multiple vehicles inside while still making room for camping. It is loaded with amenities that include a comfortable queen size bed. 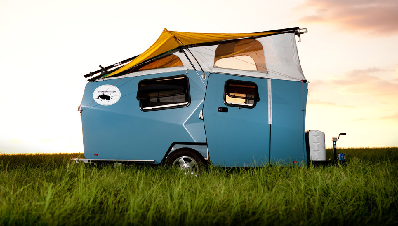 The Safari Condo is a stunning trailer camper that extends upward and outward to create room for up to four people. It has all the comforts that a small family could ever need: toilet, kitchenette, dinette, and comfortable beds. 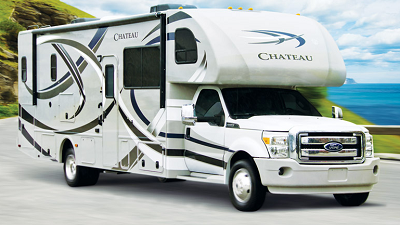 If you’re looking for a Class B motor home, then fix your eyes on the Roadtrek N6 Active. 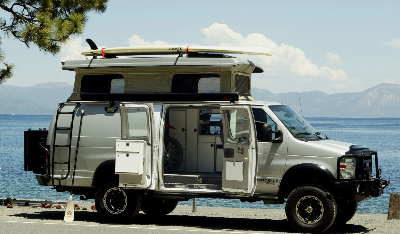 The N6 can be converted from a six-passenger van into a camper in just a few quick moves. It features an onboard sink, refrigerator, and even a microwave. 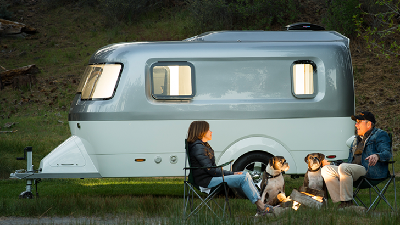 Yet another among the list of amazing trailer campers, the Nest Caravan It is as tall as it is spacious. It comes with a queen bed, and stainless-steel features including lots of high-tech components. 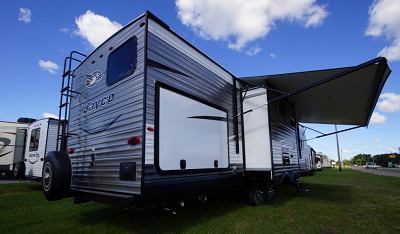 One of the most popular trailers in America, the Jay Flight has an 81-inch ceiling, house-grade carpet, tinted windows, and a wide range of floor plans to suit any taste and style. 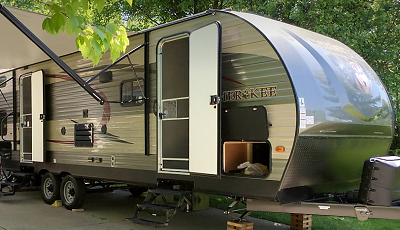 You can pick your own amenities and go all out with this beautiful trailer. 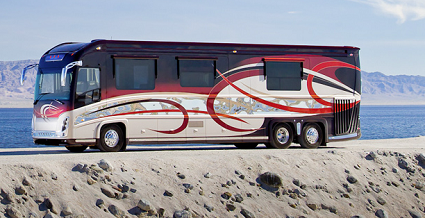 The Via is a three-bedroom coach that offers unmatched comfort on or off the road. It also offers a full shower, a two-burner stove, full size refrigerator and high-quality flat-panel TVs. The Cherokee delivers unsurpassed comfort in every area imaginable. You can choose from bunk housing, super cushiony furniture, and a fully loaded kitchen complete with all the appliances. There’s plenty of room for up to 9 guests. 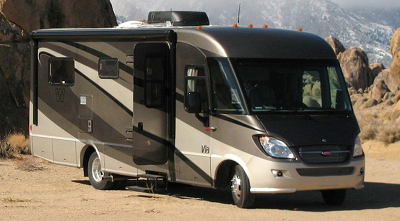 Although the Thor is technically a Class C motor home, it designed to be spacious enough for a Class B experience. It has a powerful 6.7-liter diesel engine and can pull 660 lb./ft. of torque. Don’t forget the king-size bed and dual flat-panel TVs. The best thing about the Freedom Express is how family-friendly it is. It is a bunkhouse model, meaning there is plenty of room for comfortable sleeping. There is also more than enough storage as well as a full-size kitchen and high-definition entertainment center. Of all the RVs on this list, the Lacrosse 331 BHT offers the most storage for travelers going on long trips. It features a huge bunk room, an additional half-bath, massive entertainment center, and a sofa that converts into a queen-size bed. 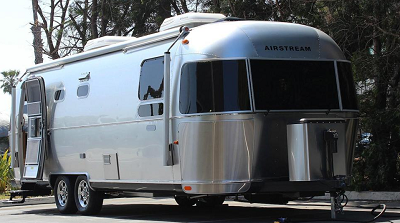 Airstream’s silver aluminum trailers are an institution all their own. The 28-foot land yacht comes complete with lush furniture, Italian-style cabinets, Corian counters, and LED lighting that is more than adequate to illuminate the interior. 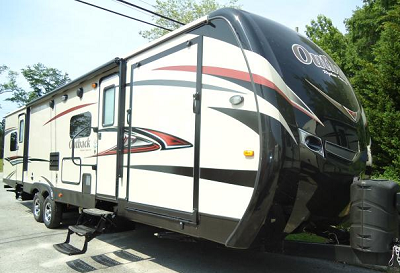 The Outback is a state-of-the-art RV that offers all the roominess of a full trailer, but at half the weight. It offers a unique front cargo room that can be used as a bedroom or provide additional storage. The best thing about it, however, may be the addition of a king-size bed. 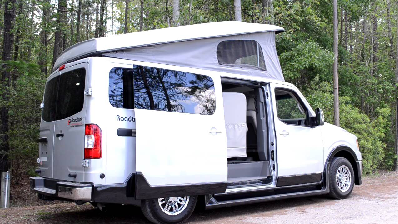 The Ford E-350 is not technically an RV, but it has enough space to attract families looking for a more affordable option. What separates the Ford E-350 from other motor homes is that it can tackle the terrain and get you further into the woods than a standard RV. Of all the budget-friendly campers on the market, the Rockwood Tent Trailer is a must for dual camping. Once it folds out, the Rockwood features two 70 x 80-inch beds, a shower, a miniature dinette table, and a loaded kitchen. At only 6ft tall, it’s delightfully compact. Newell RVs are basically a five-star hotel on four wheels. 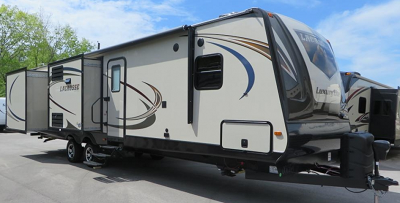 Newells provides the most exclusive and custom RVs on the market today. It is loaded with high-tech features, appliances, and advanced security features.